One of the U.S. horsemen that I most admire is Major General Guy V Henry Jr.
After the Spanish American War, Guy V. Henry was one of the most influential military horsemen for the imporovement of the training and conditioning of Cavalry mounts. He spoke out that the Cavalry needed to be better educated in both riding and care and conditioning of animals. His suggestions for improvement included better education at the Cavalry School and that mounted competitions be adopted so men would be more interested in improving their horsemanship skills. He suggested that a chief of cavalry be appointed in order to oversee and give direction to education. Guy V. Henry was born in Nebraska in 1875. He was the son of legendary horseman Guy Vernor Henry who served in the Civil War, the Indian Wars, and the Spanish American war. Guy V Henry, Jr. graduated from West Point in 1898, just in time to serve in the Spanish American War himself. He graduated form the U.S. Cavalry School in 1903 and again in 1924. He also graduated for the French Cavalry School at Saumur in 1907. The first actual equestrian Olympic competition was held in 1912. Guy Henry was given the ominous job of organizing and training the first Army Equestrian team. Henry had little time to prepare his men and horses for the Olympics which he had to do so during the freezing wintry weather in Kansas. Guy Henry accomplished the impossible in training and assembleing this team. I’ve lived through winters in Kansas. Even average days almost always send modern horsemen to their indoor arenas, while the severe weather keeps them dismounted. But not only did Guy Henry and his men beat the weather, they beat the clock in preparing for the Olympics, starting at the end of January in 1912 and leaving for the competition in June. In addition to training and preparing the team, Guy Henry also competed as a member of the team in all three equestrian disciplines: three day event, show jumping and dressage. And he rode the same horse, Chiswell, in both dressage and three day event. And to ice the cake, the three day team won the bronze, Guy Henry took 11th in Dressage, and he also rode on the 4th place show jumping team. It’s almost as though the team succeeded by Guy Henry’s will and determination. It was a while before the U.S. Army Equestrian Team took its position as a leader in equestrian competitions but by 1932 events, opportunities, and fortune all fell into place to produce the first U.S. “dream team” with Major General Guy Henry as the Chief of Cavalry. At the 1932 Olympics the U. S. Army team won the individual bronze for dressage, team bronze for dressage, individual silver in Show Jumping, individual silver in three day event and a team gold medal in three day eventing. This is a strong testimony to the skill and dedication of Guy Henry’s training. 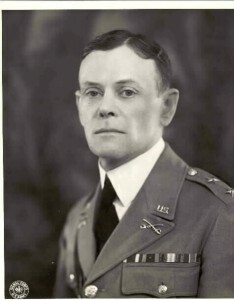 Guy Henry helped to bring about change in the training for the U.S. Cavalry but beyond his retirement in 1939 he continued to contribute to the development of horsemanship, sportsmanship and competition in the U.S. Major General Guy V. Henry, Jr. is truly one of the great men in U.S. horsemanship history.